Lewis Black has built a career on giving voice to the anger of Americans. His standup fills theaters across the country and his appearances on The Daily Show draw hoards Online and on TV. But the current political climate is driving Lewis and his long-time comedy partner, Kathleen Madigan, north for an extended tour of Canada. 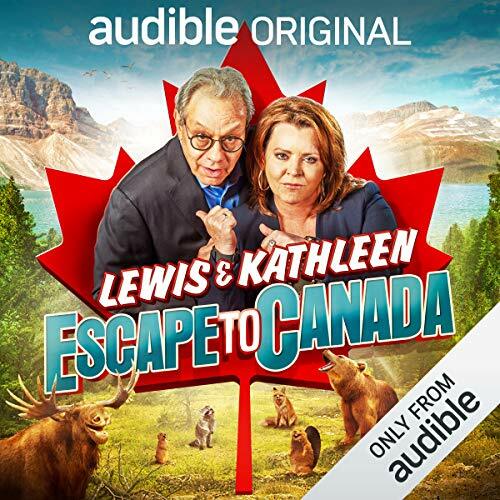 Lewis and Kathleen Escape to Canada is a stand-up album with way more than just jokes. The Grammy-award winning comedian performs rants sent in from the public, and he and Kathleen respond to them from the stage. They also bring us onto their fabled tour bus, as they crisscross Canada stopping at places like Winnipeg, Thunder Bay, and Regina to explain why things are the way they are in the USA. While I’m sad to have wasted my money on this, I more thrilled that I didn’t burn a credit on this. While I am a big fan of both Lewis Black and Kathleen Madigan, this lacks direction and comes across as a crass and tawdry money grab. Black dominates most of the recording from various shows performed in Canada, very little is heard from Madigan other than the unscripted conversations she has with Black. Some of them are brilliant, most are mundane. So chopped up that one cannot enjoy the rhythm of the comedy. As soon as a flow of material starts, it cuts with loud annoying music to something else. Sadly that makes this feel more like an overly long movie trailer. disjointed, a lot of Lewis Black reading audience notes mixed comments on travel accross Canada. I'm a fan of both of the comedians, but this wasn't an entire set. It was mostly just brief excerpts (real brief) from each of the cities on the trip, where they read the letters on stage, and normally just one or two. There wasn't a coherent story to it. If you're looking for a whole comedy set (such as Lewis at Carnegie Hall), this isn't for you. If you're looking for continuity, this also isn't it. If you don't mind Lewis reading a few things on stage (and I don't, BUT this isn't what I hoped for), then it's got some good bits and it's funny -- and way less Kathleen than I was hoping for on a dual-titled story. Seriously, WTF?!? It’s 45 minutes of broken drunken audio of them answering audience questions? I love both of these comedians, but it sounds like the drinks got going long before the stand up did. I’m mean that’s a great life, but I don’t record all my drunken nights out and sell it. 🤔 I may have a good idea...., but anyway it’s a NO.